Photo: World class hunter Warren Page with his trophy Wyoming buck, ca. 1953. Warren Page Papers. The Wyoming pronghorn is prized by big game hunters from around the nation. About half of the world-record, trophy-class pronghorn have been bagged in Wyoming. The Boone and Crockett Club was formed in the 1930s to begin ranking big game animals. This club devised a scoring system for each of the big game animals. For the pronghorn, the ranking is based upon an overall score from a combination of horn length, horn circumference, distance between the horns, and length of the prongs. Among the world-class hunters who have sought to bag a trophy pronghorn in Wyoming was Warren Page, a former editor of Field and Stream, a popular outdoor magazine. 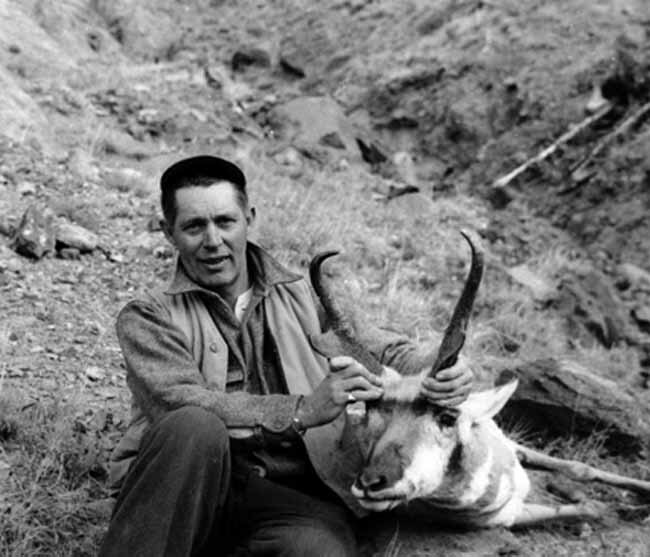 Page hunted numerous big game animals in Wyoming in the 1950s. The heads of trophy bucks are often mounted and displayed in homes or businesses where they add a touch of “Western Flair” to a room and serve as conversation pieces.